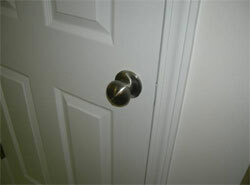 The satin nickel finish of the interior door knobs compliment the cabinets and light fixtures throughout the house. The Schlage knobs that the builder installed in our house have a finish and quality that match the exterior door handle set and have a fine, smooth motion when you turn them to open the various doors in the house. Are you a homeowner or a commercial establishment owner still in the building stage and thinking about details like how to determine if a door needs to have a lock on it? Do not dwell too much on the obvious. Exterior doors certainly need to have locks installed on them, and the locks, along with other security systems, should be properly installed. Invest in a quality door lock for your home or office. It is easy to determine which door will need to have a lock. Simply assess the areas that require privacy and security from prying eyes and hands (including kids or guests) and you will be able to decide. The main door, cellars, workshop areas, patios and balconies are some of the other areas of the house where doors should have locks. Your home garage door likewise needs a lock. Choose a reliable lock that requires minimal upkeep. Garage doors have lock options that may be a simple interior warehouse type lock or an exterior type that allows the home occupants to open the door from the outside with a key. For peace of mind, most modern home dwellers opt for an electric garage door operator, which eliminates the need for a door lock. For your main door, choose a lock that offers maximum security. There are many inexpensive and easy-to-install door locks on the market that work by locking the doorknob of the door, but intruders can use devices to release the pressure which keeps the spring in place, or simply smash the doorknob with a wrench or hammer. Lock and bolt manufacturers share online tips like how to determine if a door needs to have a lock on it (for inner parts of the house). Having young kids in the house necessitates a door and lock (or at least a safety gate that will not topple over) on certain rooms like the laundry area. Even cabinets can have easy-to-use bi-fold locks installed on them, this helps keep little fingers out of them. Among the doors that homeowners tend to leave unlocked, especially since the lock tends to jam, are sliding patio doors. A replacement lock kit and some basic tools like a screwdriver can fix any problem that may arise for those who do lock their patio doors. Exterior doors understandably need to be locked for security reasons. In many cases, though, the homeowners themselves encounter inconveniences caused by faulty door locks, or instances when they lock the door from the outside (using a cylinder lock, for example) but forget the keys inside the house, requiring a locksmith's help to get in again. A quality door lock may be more costly, but it can be a worthwhile investment. Door lock trends keep evolving, and among the most secure types that have been used on building doors for ages is a strong mortise lock. Turning the key in such a lock lets a hardened steel bolt shoot deep into the doorframe. Intruders trying to break in are likely to end up destroying the door or doorframe first before the lock gives way. There are also newly developed locks, like the keypad entry door lock deadbolts and latch bolts, which require no keys and are touted to be un-pick able. Main doors of apartments and other types of residential as well as commercial structures need to have additional locks like heavy-duty deadbolt locks. If you are building your own home or office, learn the benefits of security systems and consider small but important things like how to determine if a door needs to have a lock on it then sort out major manufacturers of door hardware that can offer years of reliable use.